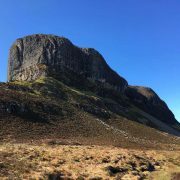 The start of the brown trout season has us venturing up into the lochans of the isle of Eigg, an Island formed from a volcanic eruption many millions of years ago…. 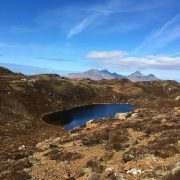 The journey itself to these wild trout lochs is just as rewarding, the winding trail taking you to the foot of the well-known Sgurr and along its traverse with its unmatched views of the isle of Rum’s cuillin mountain range. 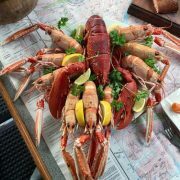 We are pleased to announce our new food addition to our trips – Luxury Seafood Lunches. 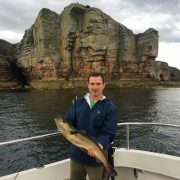 We have carefully selected the best quality produce from local fishermen and business to provide a luxury lunch on selected private trips, on request. 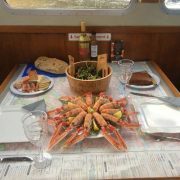 The Lunch which is generally served after a short remote hike and mainly consists of creel caught langoustines, hot & cold smoked salmon, a selection of Scottish cheeses, mackerel pate and oatcakes, all washed down with a lovely bottle of white wine. 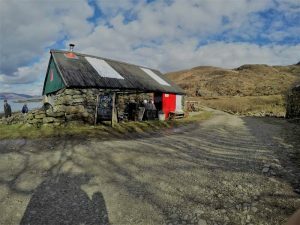 When customising the appropriate trip for guests in mid-April it can be complex as there is limited wildlife in our local waters, the fishing is at a minimum, my guests have told me that they will be dining at The Roads End Café in the evening, so I have decided not to visit Veronica today. 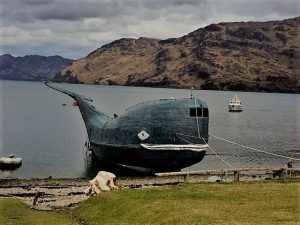 We decide on the scenic cruise and a lesson in history covering subjects such as Ragnar of Knoydart, the Jacobite’s and the relevance of world war 11 mica mine which played an important part supplying Mica when it was in short supply and last but not least our local characters and heroes such as Tom McClean AKA Moby. 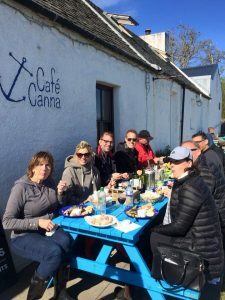 Its Easter Sunday and our guests at Caberfeidh House our B&B are tucking into a full Scottish breakfast and getting ready for the day ahead with Minch Adventures. With everyone onboard the conversation regarding the S.O E’s (Special Operation Executives) is the order of the day. 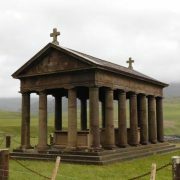 Neil, Keith, Jools and Marnie travel all over the world to find out and visit as much historical sites where the S.O.E’s have been carrying out their secret training/manoeuvres. 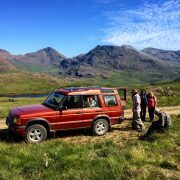 Knoydart was inevitably on the hit list. 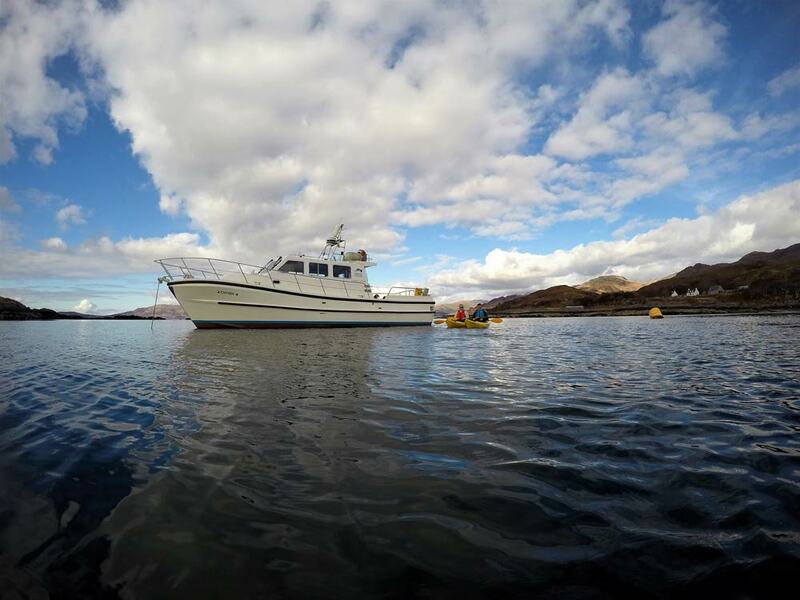 Heading out of Mallaig to Loch Nevis (Loch Heaven) the weather is glorious, sun shining and bright blue skies. Approaching Inverie harbour we discuss on what sites there are to see, the Seven Men Of Knoydart cairn, the medieval cross at Kilchoan Estate which dates back to the medieval days and is the only standing stone cross in Scotland that hasn’t been defaced and the Inverie House where the S.O.E’s were know to have stayed. After our walk we bump into a local gentleman Iain Roberson, former owner of the Old Forge on Knoydart, Brittan’s remotest pub who tells Neil and Keith all about the agents and who operated in the area, this has them routed to the spot with excitement and has them rolling with laughter with a finishing story that turns into a joke about a German called Donnie the spy. 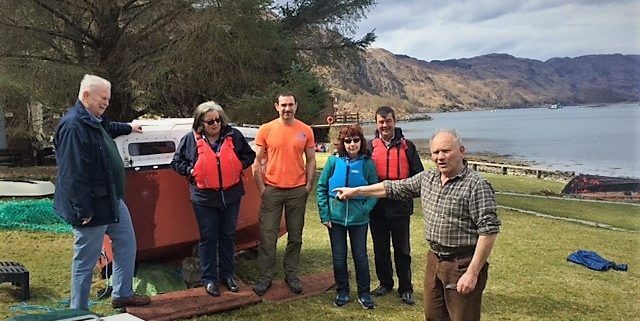 Back at the boat we head over to Airor for coffee and cake at The Roads End Café which has the most idyllic setting, looking over the Cullin of Skye which has had a recent dusting of snow to add to its beauty. 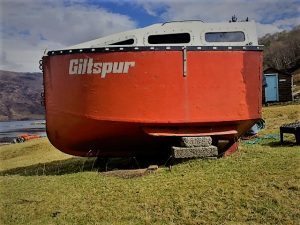 A dingy tender to the café adds to the excitement. Veronica makes the most delicious cakes with a fresh cup of coffee, this is a must have. The tide is coming in quickly and if we don’t make a move from this beautiful place, the dingy and Kayaks are going to leave us stranded. 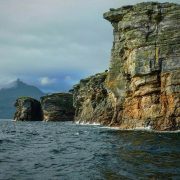 The guests are more than eager to have a go on the kayaks and with no hesitation head out to the little islands, within seconds they are both surrounded by seals and their very curious pups, the guests view wildlife in its time frame up close and personal. 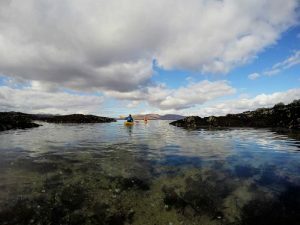 This is a first-time experience for the guests and they savour the moment as seals duck, dive and swim under the Kayaks giving a bird’s eye view in the bright waters of Airor. 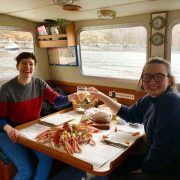 Back on board the Cyfish anchor hauled we cruise south past the anchorage of Doune and Maryanne’s point back to base camp, Mallaig. But before we enter the harbour I have a fish trap to haul, this adds yet more interest to the trip and reveals a mixture of marine life which never ceases to amaze me even after 30 years at sea on trawler. A fine-looking example of a sea scorpion fish stands out imminently amongst an array of starfish, eels, brown crab and sea-urchins. After mooring up safely beside the pontoon and the days cruise at an end we ask our guests to dine with us back at Caberfeidh House, this highland hospitality just seem like the right thing to offer as we continually connect and make friends with the most amazing visitors that choose our activities and accommodation.